Dentist Columbia, Cayce South Carolina Cosmetic Dentist – Nick Pournaras, D.M.D. Meet	Our Loving and Caring Team!! Welcome to Columbia Smiles, the restorative dental practice of Dr. Nick Pournaras and Dr. Max Frawley. Along with Dr. Nick and Dr. Max, as we call them, our entire team shares a genuine excitement and enthusiasm for dentistry. Coupled with a true love for people and a strong work ethic, this passion has allowed us to expand our practice into a tight-knit community of happy, loyal patients. We hold ourselves to the highest standards at Columbia Smiles; customer service, value, and quality care are the cornerstones of our practice, and we strive to uphold these values with every one of our patients. We’re not living up to our high standards unless you leave our Columbia, SC Cosmetic and Restorative dental practice completely satisfied with your experience. Visits to our modern, conveniently located dental offices are anything but routine – marvel at the beautiful artwork canvases displayed on our walls, flip through the latest issue of your favorite magazine while listening to soothing music, or chat with one of our caring team members. Whether you are undergoing a biannual cleaning and examination, smile rejuvenation with porcelain veneers, teeth whitening session, or the placement of a metal-free restoration, you’ll soon forget the reason for your visit, because you’ll be too busy enjoying your surroundings. 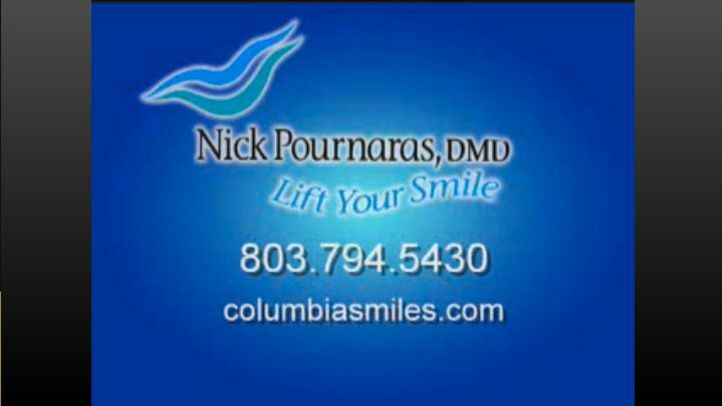 Columbia Smiles is under the leadership of esteemed dentist Nick Pournaras, a South Carolina native who has dedicated his professional career to helping individuals improve their oral health and rejuvenate their smiles. He has been honored one of six dentists in the state of South Carolina who have received an Accredited Membership by the American Academy of Cosmetic Dentistry (AACD). Perhaps as tribute to Dr. Nick, or to our incredible patient base, many of our tremendously talented staff members have been at Columbia Smiles for multiple years. Long-time patients have come to expect the signature positive attitude and good humor of our team members and you can as well. We understand that our patients’ calendars are chock-full of responsibilities to work, school, family, and friends; for your best interests, we continually seek ways to make dental treatment convenient and accessible. Columbia Smiles is thrilled to incorporate the CEREC® One Visit Porcelain Restoration system into our practice. With this technology, Dr. Nick and Dr. Max and our staff can design, craft, and place custom porcelain crowns, inlays, and onlays in one short appointment at our dental practice in Cayce. This system eliminates the need for multiple visits to our practice when your schedule doesn’t allow for it. Contact Columbia Smiles today for more information about this incredible system. Missing teeth can do more than put a damper on your smile; gaps between teeth may affect your facial structure and cause oral health problems. Dental implants are the most reliable and permanent tooth restoration option available today. Once your implant posts have been surgically placed, Dr. Nick and Dr. Max will top it with a beautiful porcelain restoration to blend in with your surrounding teeth. You’ll be able to speak, chew, and smile normally. Are you seeking a truly exceptional dental practice in the Columbia area? If attentive service, quality care, and beautiful results are important to you, contact Dr. Nick and Dr. Max and the team at our Columbia dental practice. We are always welcoming new faces into our office, and we look forward to meeting you in person! Columbia Smiles Downtown is located in the historic district of downtown Columbia. Our boutique dental office is in loft suite 600 of the Palmetto state building. Columbia Smiles Downtown is a modern dental office with a unique style and relaxing atmosphere. Our location includes a state of the art sterilization area, dental suites featuring massaging patient chairs, outfitted with the latest technology. Though only a short time, while you wait, we offer refreshments to match the elements, as well as smooth custom leather couches and a WIFI bar. A complimentary warm towel sprinkled with pure essential oils will be delivered to you for an added touch following each dental experience. We are located on the 1300 block of Lady Street in the Historic District of Downtown Columbia. You can enter at 1310 Lady Street and our office is located on the 6th floor of the historic Palmetto State Building. The well known Lunch Box is directly across the street from us and Ashley’s Alley Salon is in the same building as we are. We offer complimentary Parking for our patients. For map and directions click here. “Fifty and Fabulous!! That’s how I look! I am a grandmother of five beautiful grandchildren and a Corporate Executive for a major cosmetic company. Appearance is everything! In turning fifty I knew that I wanted to change something about myself, but didn’t want to go under the knife to accomplish that... My cosmetic enhancement has not only given me more confidence for my self-esteem but my veneers have made me look 10 years younger!" “Being in the cosmetic industry as a Mary Kay Senior Sales Director, I have found that appearance plays a huge role in gaining trust from my clients. But form all the education and experience Mary Kay has given me, they could not enhance my smile. Although I had a nice smile before I am a perfectionist and was in search of a flawless smile. Dr. Nick and his team sold me from day one because they were such a courteous and positive team, but above all, they listened to what I had to say." “I was always told that I had a nice smile, but I couldn’t see it while looking into the mirror. After discussing the possibility of getting veneers with my wife, I made the decision to go ahead with the process. Now, when looking into the mirror, I can see the smile that I always wanted, but never had. I’m blessed and thankful for the things that I have in life and thanks to Dr. Nick and his team, I now have an awesome smile that can be added to the list..."
“Before having my teeth veneered I was very uncomfortable with my smile. Over time my teeth started darkening and chipping away right before my eyes. One day while having my check-up, Dr. Pournaras asked me if I had ever thought about having my teeth restored. He explained the procedure and told me they would be beautiful, and they are! Thanks to Dr. Nick and his team for their concern and enthusiasm. This is one of the best decisions I’ve ever made. Now I just love to smile!" "I had been unhappy with the shape of my teeth and the small gaps between them since I was young, even after braces! So finally as a college graduation present I got my wish. Now instead of people telling me I have a nice smile I hear words like beautiful, phenomenal, and wow you really have gorgeous teeth. The best part about my veneers is that no one would ever guess that I was not born with them. That’s how natural they look!